Canadian PM Justin Trudeau has attended a vigil to honour the 15 killed in a crash involving a bus carrying a junior ice hockey team. Ten players on the Humboldt Broncos team, aged between 16 and 21, died when their team bus collided with a semi-trailer in Saskatchewan. Hockey teams from around the country paid tribute to the dead during weekend fixtures. Broncos team president Kevin Garinger said that Haugan believed that "the Humboldt Broncos were about not building hockey players but creating amazing young men". "He's sadly missed by our entire organisation." Assistant coach Mark Cross, 27, was remembered as "a ferocious competitor who had a vibrant approach to life", by York University Lions men's hockey head coach Russ Herrington. Cross played for five seasons with the college team. Broncos team captain Logan Schatz, 20, played for the Broncos for more than four years. "The first night he was here, he walked in and he was checking the fridge to see what we had for leftovers," Colin Brochu told the Globe and Mail. Player Xavier Labelle, 18, had been incorrectly identified by authorities and was believed deceased, but is among the injured. Photographs posted on social media showed several injured members of the team holding hands with each other in hospital. One team member's father, Tom Straschnitzki, said his son Ryan was in hospital with a serious back injury and that he could not feel his legs. The family flew to his bedside on Saturday. "He keeps asking about his team and coaches," Mr Straschnitzki told the BBC from his home in Airdrie, Alberta. "I say: 'I don't know son'." Myles Shumlanski, father of one of the Broncos players, described the crash scene as a "disaster" to the Saskatoon Star Phoenix paper. "We had a crane lifting the bus," he said. Rob Muench, the mayor of Humboldt, said it would take years for the community to come to grips with the tragedy. Nipawin Apostolic Church lead pastor Jordan Gadsby told the BBC he had opened his church to families shortly after learning of the crash. Users on social media expressed solidarity using the hashtags #prayersforhumboldt and #humboldtstrong. Mr Trudeau said the entire country was "in shock and mourning" along with Humboldt, which has a population of only 6,000. "Our national hockey family is a close one, with roots in almost every town - small and big - across Canada," he added. He has received condolence calls from other world leaders, including US President Donald Trump. 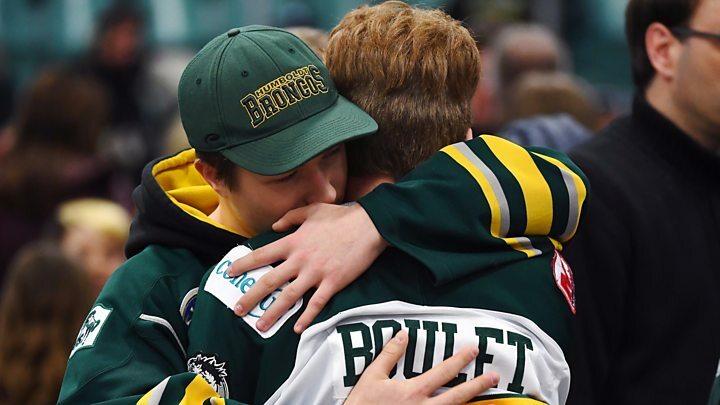 Humboldt Broncos President Kevin Garinger said the club were "heartbroken and completely devastated" by the tragedy. The young athletes who play in the competitions like the Saskatchewan league often go on to play for colleges, major junior teams or the National Hockey League. In 1986 a bus carrying the Swift Current Broncos junior hockey team hit a patch of black ice on a Saskatchewan stretch of the Trans-Canada Highway, killing four players.